Where is Aizen Sousuke after the Quincies wreak havoc in Seireitei? Last time he was seen, he was meeting the Quincy king, Ywach, and Ywach mentioned that during the short meeting, Aizen used his power on him. Does this means that Aizen has escaped? Did Ywach set him loose? Aizen was sealed. It was revealed in chapter 617. He was released by Captain Kyouraku in chapter 617. Kyouraku himself didn't mean to release him completely, but somehow he is. It wasn't clear who destroyed the initial seals as Kyouraku used only the key to unseal Aizen's mouth. 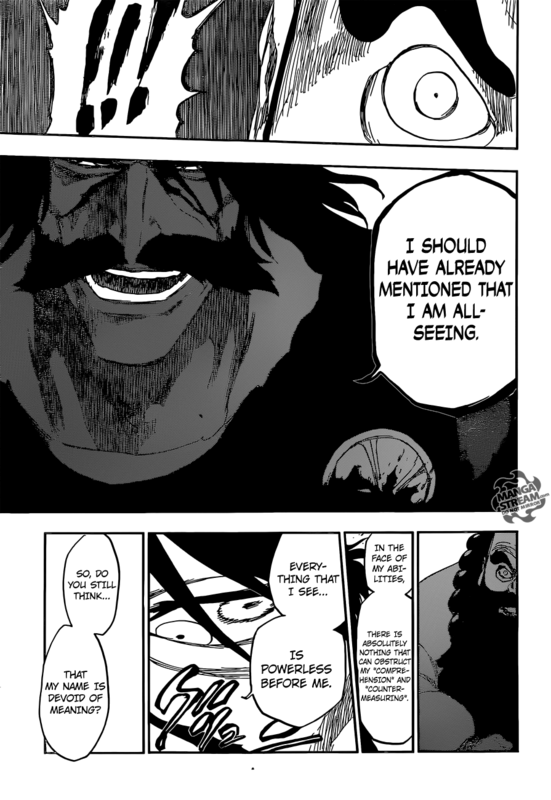 It was probably Yhwach who did that as Yhwach himself stated during his fight with Yamamoto Head Captain that he met Aizen. Aizen could not have forced Juha A Bach to release him. Ywach's power enables him to understand everything and render it powerless against him. If Aizen has been released it was by Ywach's own will, not because Aizen was crafty enough to get him to do it. What was Gin Ichimaru plotting when he encountered Ichigo at the Hakuto Gate?